DOEL Laptop- Made in Bangladesh! India launches its very own $35 Android Tablet and now Bangladesh launches Doel Laptop! The Prime Minister of Bangladesh, Sheikh Hasina launched Doel yesterday, the first ever laptop made in the country. As a Bangladeshi, I am really proud of it! At least it’s a good start! Maybe one day we do not have to rely on imported electronic items any more, everything would be produced here in Bangladesh! Well those are all lofty hopes. What’s the main attraction of Doel laptop ? Amazingly cheap. 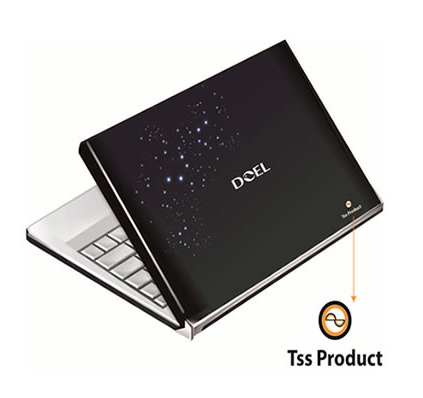 With only $130 ( around TK 10000) you can have the DOEL Laptop in your hands! That’s the cheapest one out of the four versions. You really would not expect to play HD movies or play Battlefield 3 in this laptop. This has been specially made so that people who cannot afford those high-priced laptops can at last have one. Main aim of the government is to spread the IT knowledge across the country. 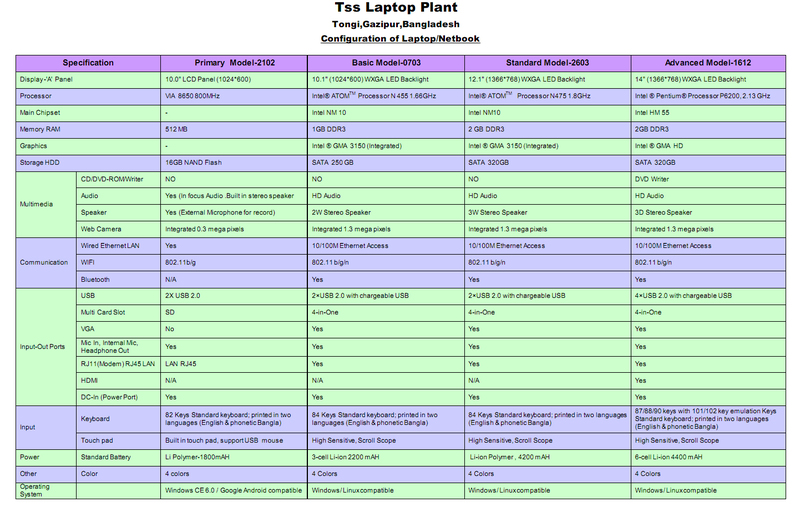 The laptop has been manufactured by Telephone Shilpa Sangstha (TSS) and also has collaboration with BUET, Malaysian Thin Film Transistor (TFT) and other foreign experts. Right now, only 10% of the parts are made here in Bangladesh but the TSS managing director Mohammad Ismail pointed out that he was confident to produce about 60% of the laptop parts within 6 months! Here is the table which describes the specs of the different versions! Pretty Good start don’t you think ? But here is the deal. Doel is not yet available to everyone 🙁 According to the government decision, the laptops would be distributed to the government organisations and then later to be released to the public. It’s great to see that finally the technology industry is rising here in Bangladesh by unveiling one of the world’s most cheapest laptops! Moreover, such initiatives would also increase employment in Bangladesh, increase literacy rate and head towards economic development of the country. If the government can maintain this track on the technology sector, Bangladesh can eventually break out from the label- under-developed country. Chrome Remote Desktop- Get access to any computer ! Where is Bangladesh? I guess it would be beside India. Great start, wish Bangladesh will get a good Laptop brand. Doel laptop from Bangladesh!! Really interesting I would like to see how it comes for people as it's the newest laptop brand in the world. This is definitely a good starting by Bangladesh. I hope this country can continue this brand with the help of people to bring the brand in the line of other pustular brand. I found this doel brand from Bangladesh. I think as it is coming from developing country, initially there will be some disorder but in course of time the brand may be very popular in Bangladesh. Best of luck. Great start. Hope, one day doel laptop will the best laptop brand in Bangladesh. i will buy it. this will be awesome…………………..
Nice start up, thanks for the info…..
Dont hate on bangladesh, alot of great products are made there. if everything was made in America, we wouldnt be getting anywhere… not to say that we are lazy… we just …..soo maybe we are just lazy?? The laptop is not yet available to everyone 🙁 According to the government decision, the laptops would be distributed to the government organisations and then later to be released to the public.<—– whay…??? Oh i read an article about this the other day, gotta agree with you – it's a good initiative! I must say this is really good . I wish everyone will get benefit from these two devices . Pretty good start. I just hope this laptop will reach every villages and cities along with internet access. I hope the same too Nasif 🙂 Can't wait to buy it!